This might sound like a no-brainer, but avoid coffee and any source of caffeine in the afternoon/evening hours. Even small amounts in chocolate and tea might have an effect on your system, so it’s best to avoid it. If you are a coffee drinker, try to stick with 1-2 cups in the morning and make it a goal to say “no” to that tempting mid-day iced coffee. Turn off any unnecessary electronics (i.e. TV, radio, computer), and keep your phone away from your bed when it’s time to go to sleep. Charge your phone away from your bed. Try to get outside or be around natural light in the daytime. This will help your body get more in tune with evolutionary-based circadian rhythms. Come nighttime, avoid bright lights and try to limit exposure to TV and computer screens. Even though you might be tired throughout the day, taking a long nap (longer than 30 minutes) might affect your sleep cycle and make it harder to fall asleep. Instead, try exercising or engaging in a physically or mentally stimulating activity to keep your energy up when you’re tired during the day. On the topic of exercise, find a time that works for you, and stick to it. Some people find that working out in the morning is not only more convenient, but sets the stage for a more energy-filled day. Others like to exercise at night. As long as it doesn’t prevent you from falling asleep, exercising at night should be fine. If you are indeed feeling a little pumped up after a PM workout, try taking a hot shower or bath to soothe and relax your muscles. If you’re sensitive to light while falling asleep, consider blackout curtains or an eye pillow. Pets are lovely, but if your dog or cat has a tendency to make your head its personal pillow at night, consider sleeping apart from your furry friend. If anxiety keeps you up at night, try to figure out what’s behind your worries. Cognitive behavior therapy (CBT) is a form of therapy that can be done via specific self-help books or with a therapist, and involves changing cognitive distortions (or negative ways of thinking) that can lead to depression and anxiety. Also, journaling might be helpful to sort through your own thoughts. Try not to judge your own thoughts and instead let your thoughts flow from your mind to your pen to the paper. Then, see if you can find a pattern in your thinking. Get comfy. I’ve mentioned making sure your sleeping space is dark and distraction free. You can also use aromatherapy, massage, and yoga to relax your body and mind. Lavender, chamomile, and jasmine are some scents that can come in the form of essential oils and lotions, and really do help one to relax. Yoga poses along with breathing exercises can help connect your brain to your body in a relaxing, healing way. 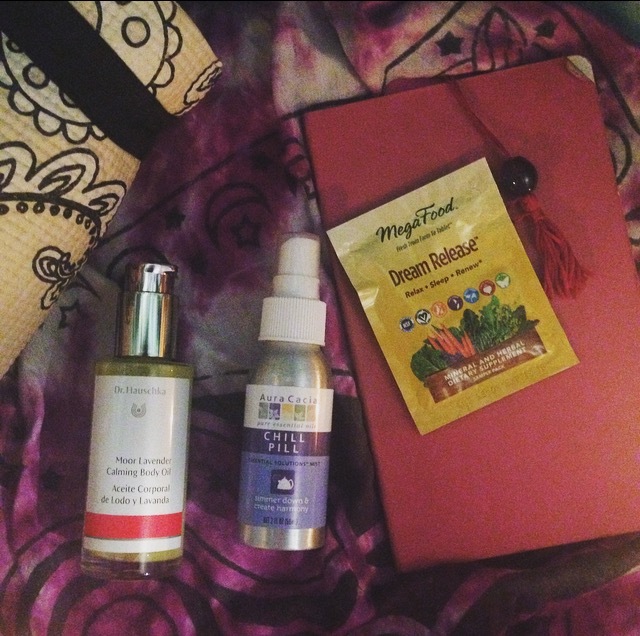 a yoga mat, essential oil lotion + spray, supplements, and a dream journal = a peaceful mind at night. Keep a dream journal. I’m fascinated by my own dreams, although sometimes I wake up after a dream and can’t fall back asleep. Writing down themes of a dream and then doing something relaxing, like reading a beautiful poem or listening to a favorite song can help to you to relax and help you fall asleep again. Then in the morning, you can analyze your own dreams, if it interests you. Try yoga nidra, a type of guided meditation, or other guided meditation podcasts and tutorials that can be found using google or available through apple podcasts. Eat a light snack before bed if you’re hungry. Try to aim for a balance of carbs & a little protein. A small amount of trail mix, whole grain crackers with a tablespoon of almond butter, or 6 oz. soy milk & a banana are some suggestions. Try to stick to a routine. This includes when you go to bed, what time you wake up (or set an alarm to wake up) and what times you eat throughout the day. Although it’s fun to live spontaneously, our bodies were meant to sleep and eat at certain points. Get into healthy, realistic habits, and become more attuned to your body’s needs. Well, those are all the things that have been helpful in my experience. I hope you have a good nights rest!